Is this the first time you have documented this complaint? Is there a history of this complaint made by you on previous visits before 12K elapsed? Have you talked to the Service Manager? MBUSA? Good news. After voicing my displeasure with my service advisor, he spoke to the service manager who then spoke to MBUSA and they approved a one time "good will" repair and replaced the front brake pads and rotors at no charge. The car feels much better now. Thanks. 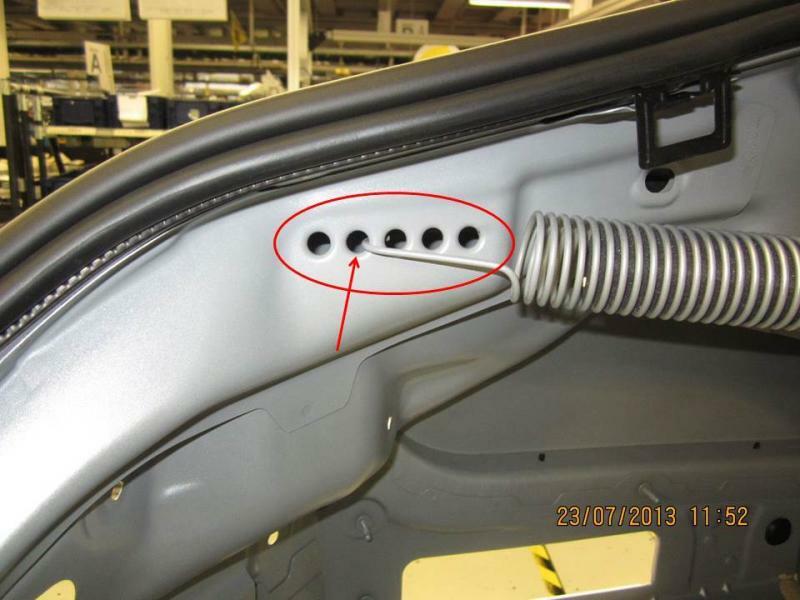 LI91.45-P-056629 JUL13 – 207 switch for seat belt extender inoperative, coding problem in rear control unit. LI91.10-P-054143 JUL13 – 204, 207, 212 and 218 seat fore/aft adjustment nonfunctional, replace motor, shafts and motor retaining plate. LI05.1o-P-056435 JUL13 – 276, 278 and 157 engines rattling noise after start for several seconds, install check valves/replace left & right secondary chain tensioners. LI68.10-P-056727 JUL13 – 207, 212 and 218 glove box squeaks/rattles, attach felt to mounting at top left. LI46.35-P-055485 JUL13 – 204, 212, 207 and 231 with direct steering (code 211) engine does not start, or various fault messages in IC immediately after engine start and servo assistance reduced, update steering software. LI27.19-P-056898 AUG13 – All models with NAG2 (7-speed transmission) in combination with OM651 or OM642 (diesel); 218 & 212 with 278 + 4matic delayed start-off from standstill / lurch when coming out of power-free state / jolt when brakes are released, update software. LI91.10-P-056733 AUG13 – 207 rattling noises from backrest while driving, install felt. LI30.30-P-056782 AUG13 – 218,166, 172, 204.9, 216, 231 production date 4/1/13 to 6/30/13 with Distronic plus (233), system occasionally reacts too sensitively to vehicles in adjacent lane, perform initial startup of radar sensors control unit - may contain default values instead of vehicle-specific values. LI54.65-P-056779 AUG 13 – 212 & 207 facelift (804), 117 Parktronic cannot display any obstacles only ready LED lights up, update control unit software. LI82.70-P-056963 AUG13 – 207, 212, 218 Connect device function in Telephone menu is sometimes grayed out following system start although Bluetooth is activated it is then not possible to set up a connection between phone & COMAND, update COMAND online control unit software. Note: Problem is rectified after bus idle or after resetting COMAND (hold down ON button for 8 seconds). LI82.60-P-056890 AUG13 – 212 no/poor AM radio reception, insufficient ground connection of antenna amplifier. 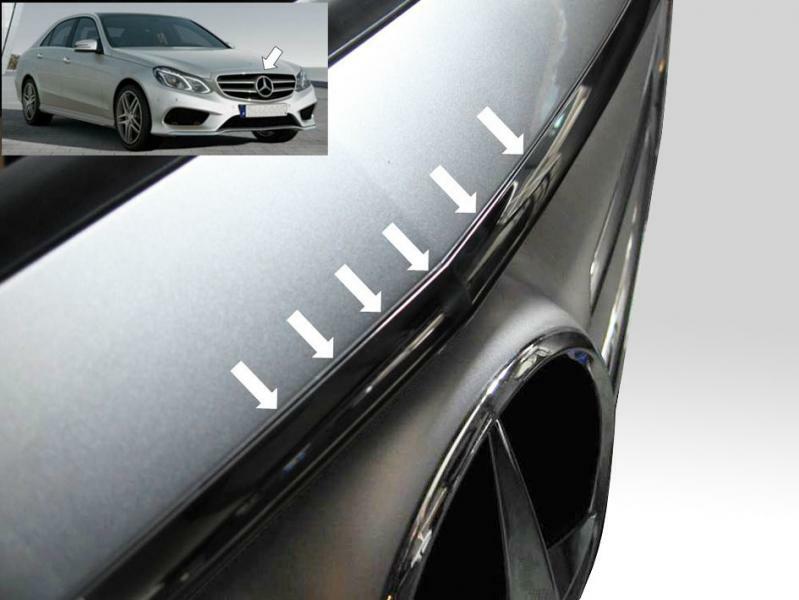 LI88.20-P-056908 AUG13 – 212 (954, P96 or 772) facelift wind noise/whistling at windshield, possible cause gap between bumper & chrome surround of radiator trim – see picture. LI07.08-P-057165 AUG13 – 212, 204, 164, 221, 230 with 272 & 273 engine radiator fan runs at 100% + fault code 2237 stored, update ME control unit software. LI54.71-P-056477 AUG13 – 212 & 218 with Blind Spot Assist (234) or Active Blind Spot Assist (237), 164 with (234) inoperative, replace radar sensors with additional silicone sealing. LI30.30-P-057139 AUG13 – 212 & 207 with Collision Prevention Assist (258) may warn for no obvious reason, update CPA control unit software. LI82.85-P-057169 AUG13 – 212, 207, 218, 221 with retrofitted iPhone Drive Kit Plus COMAND display flickers or briefly turns green/red/black, replace audio-video adapter cable from Apple - not claimable under warranty. LI54.30-P-056977 AUG13 – MY2014 212, 207, 218 analog clock sporadically executes a normalization sequence, replace clock with part # 2188270070. Sunlight rays can pass through the face to the inside causing the IR sensor to detect loss of synchronization the clock then runs a normalization sequence. LI82.85-P-057016 AUG13 – 212, 207, 218 with retrofitted iPhone Drive Kit Plus stability improvements (poor sound quality, distorted audio output, etc. ), update DKP control unit software. Following parts are affected: 1728700296, 1728700496, 2128200376, 2128200476, 1768200176. Last edited by konigstiger; 09-08-2013 at 01:27 AM. Konig, I hate to bother you --- you do so much for us. In my MY 2011 212 P2, we frequently get a "beep beep" for no reason, no cars or any kind or obstruction nearby, no chance of police or other radar emissions. And there is absolutely no message of any kind. Disconcerting at times . . .
Is it possible that's what this notice is talking about? Could you please translate what NAG2, OM651 / OM642 are? I have a 2013 E550 with this issue. I had the vehicle into the dealer last week, but the technician said that the latest software is installed. LI27.19-P-056898 AUG13 – All models with NAG2 in combination with OM651 or OM642; 218 & 212 with 278 + 4matic delayed start-off from standstill / lurch when coming out of power-free state / jolt when brakes are released, update software. Could you please translate what NAG2, OM651 / OM642 are? NAG2 = (Neues Automatische Getriebe 2) New Automatic Gearbox 2 another name for 7-speed transmission. OM651 & 642 = diesel engines. Check your email. Last edited by konigstiger; 09-08-2013 at 01:34 AM. Got it! Thank you. I've just noticed another anomaly with the transmission in "S" mode. The car will not start in 1st gear if it was originally started with "E" when shifted from Neutral. Shifting back to Neutral and then to Drive restores the 1st gear start. This may be all related, but not sure. I'll let the tech sort things out. The car IS starting in D1 when in "S" mode. The engagement surge that I was feeling (depressing the left paddle) is due to the transmission clutches being reengaged after running free. Also, MBUSA says that the jolt that I have been noticing is NORMAL (WAD) for engine 278 and 4Matic. The bulletin applies to MY2012 and up if the transmission software update had not been installed. The additional tip about greasing the drive shaft to address the issue apparently does not really fix the complaint, but can lessen the jolt if there was inadequate grease. Did you get your issue with knocking noise fixed? My vehicle sounds the same and warranty will end so soon. Heard from a fellow mercedes owner with E250CDI that there is an factory order to change the diesel injectors on W212 diesel cars. Anybody got the bulletin I can take to my dealer? LI91.40-P-057018 SEPT13 – 212, 176, 242, 246, 204, 117, 222 creaking noise from left or right front seat belt height adjustment mechanism, replace belt height adjuster. LI82.85-P-057192 SEPT 13 – 212, 218 w/COMAND NTG 4.5 Gen2 intermittently no audio output regardless of selected source immediately after engine start, update COMAND control unit software. LI82.85-P-057191 SEPT13 – 212, 218 w/COMAND NTG 4.5 mute function that was activated before last ignition off is intermittently no longer active, update COMAND control unit software. LI88.50-P-057020 SEPT13 – 218 with AMG rear spoiler lip, trunk lid does not open fully via remote unlocking increase preload of spring by moving to the fourth hole on both sides. dull thumping noises or metallic rattling from the area of the front axle occurring @ speeds 10-45 mph, modified front struts should be installed. Last edited by champaign777; 10-23-2013 at 12:57 AM. Last edited by PeterUbers; 11-03-2013 at 08:56 AM. Thanks. Now if they would just admit to this issue with 2011 M273 engines!!!!!! Service Campaign 2013100003 OCT13 – MY13 212 & 218 incorrect plastic nuts installed on under-floor paneling that could cause the panel to detach in snow or ice conditions, dealer will replace under-floor nuts. Approximately 25 vehicles affected. Service Campaign 2013090008 OCT13 – MY13 166, X166, 204, X204, 207, 212, 218, 231mbrace software does not correspond to current production configuration, dealer will update. Approximately 47,148 vehicle affected. Service Campaign 2013090002 NOV13 – MY13 166, X166, 212, 221engine control module does not correspond to production configuration dealer will update software. Approximately 11,715 vehicles affected. LI54.21-P-057404 OCT13 – 212 VIN A703805 to A736747 image interference in night view system (610), diffused light screen of the night view camera is missing. LI82.85-P-057407 NOV13 – 117, 166, 172, 204, 207, 212, 218, 246 fuel consumption indicator in system menu is incorrectly scaled or missing, update COMAND control unit software. LI32.22-P-057569 NOV13 – 212 & 218 Airmatic (489) compressor inoperative, prefuse box is faulty. Last edited by konigstiger; 11-11-2013 at 01:39 PM. Last edited by champaign777; 11-11-2013 at 03:26 PM. Does anyone have any more info on this? Not even sure if it's applicable to the E63's suspension. Does anyone have any info on this service bulletin? I've got really bad creaking/squeaking from the steering wheel on my 2010 E63. Just had it at the dealer and they lubed the boot & shield on the steering shaft which didn't do squat especially this cold morning here in Boston. Does anyone have any info on this service bulletin? 048218 applicable to MY10 e550 coupe (207) with Vehicle Dynamics Package (483). LI32.25-P-051645 FEB13 - 212.#77 / #74, 221.#74 creaking/squeaking noises from front axle when steering, replace spring cup mountings and suspension strut rubber end stop. Last edited by konigstiger; 11-20-2013 at 04:25 PM. I just had Service Campaign 2013110002 Fuel Sys ECU done on my E550. What does it do? I hear a thump every morning when i reverse out of my driveway and hit the brake to switch gears to drive. Could this be the same bulletin that applies to my issue? Last edited by champaign777; 12-03-2013 at 09:07 AM. I have a similar issue - though not every day.